A hundred years ago, no self-respecting, East Coast farm would have been without at least one black walnut tree on the property. Black walnuts were popular shade trees, and their wood was highly valued for fine carpentry work. They cast a wide, dense shadow (great for keeping the house cool in summer) and the nuts were appreciated as food. Today, black walnuts aren’t planted very much, maybe because they get to be so big (50 – 100 feet tall), and we tend to have smaller yards. Or maybe because people see the nuts as more of a nuisance than a wild edible treat. But if you’re a forager who likes to get out and wander, take heart. It’s not unusual to find mature, majestic, specimens of black walnuts in yards and parks across the country, where wise people planted them a century ago. The roots of the black walnut tree have an allelopathic effect on some plants, especially those in the tomato family and certain conifers, yet other plants grow perfectly well in the presence of black walnut trees. If you’re thinking of planting one, just keep it away from your vegetable garden and you should be fine. Black walnut trees grow best in full sun and deep, moist, well-drained soil. The actual walnuts can be harvested while still on the tree, but it’s much easier to wait until they fall. 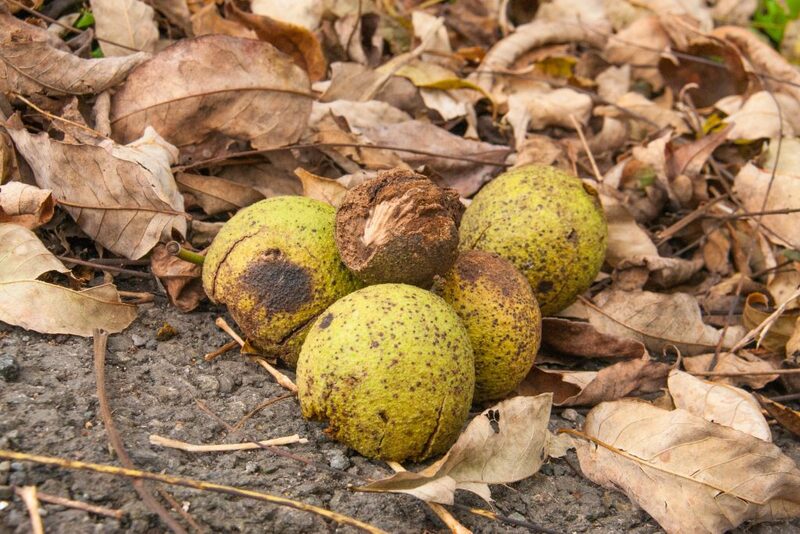 The first time I saw black walnuts lying on the ground I had no idea what they were. Who knew that nuts grew inside those yellow-green husks that looked like tennis balls? Collect them when the husks are soft enough to easily dent with your thumb. Black walnut husks are a traditional dye source and will stain your fingers a brownish yellow that lasts for weeks. (Ask me how I know.) It won’t hurt you, and some people see the color as a badge of honor. But if you’re a hand model, handle the nuts with gloves. There are several ways to remove the husks, which cling to the nut shells tenaciously. Some people drive over them with their cars. (Since the shells inside the husks are quite hard, they don’t usually crack this way.) If your driveway is a light colored concrete, prepare for it to be dotted with black walnut husk stains. I put on an old pair of boots and stomp on them to tear the husks, then peel off the husks with gloved hands, dropping the nuts into a large bucket of water. Next I scrub off any clinging remnants of the husks with a wire brush and I get rid of any floaters. (Floating nuts are hollow inside, never having developed good nutmeat.) You may find maggots inhabiting the husks but don’t worry, they can’t penetrate the nuts’ shells and won’t do any harm to the nuts themselves. Black walnuts must be cured before they can be used, so spread them out in a single layer and let them air dry for two to four weeks. Do NOT leave the nuts unprotected outdoors while they dry, or you will come out one morning to check your nuts and find that the neighborhood squirrels (or raccoons, or possums, or bears, or whatever) have robbed you, leaving only a few hollow, undeveloped nuts behind. I know it was the squirrels. The next step is shelling the nuts, and lest you think you’re home free, black walnut shells are considerably thicker than the shells of their English cousins. I used to place the nuts in a vise, slowly increasing pressure so the shell would break, leaving the nut as intact as possible. It’s a slow process, and not one that would be efficient for a commercial enterprise, but it does result in larger black walnut pieces. Now I have a special nut cracker that can handle the tough shells of black walnuts; most nut crackers aren’t up to the task. The last step is to pick the nut meats out of the shells. If you’ve ever purchased black walnuts, you may have wondered why they don’t come in big pieces, like the lovely half pecans and walnuts you find at the grocery store. Well, once you’ve cracked and shelled your own black walnuts, you’ll know the answer to this question. Every step of working with black walnuts is a challenge! The flavor of black walnuts is magnificent and unique. It’s heavy, dark, almost wine-like, and much stronger than that of English walnuts. You can combine them with milder nuts in nut breads and pies, or feature them in cookies, cakes, and ice cream. Black walnuts have a high fat content, and after shelling they should be quickly eaten or frozen. Alternatively, you can leave them in their shells at room temperature until you’re ready to use them, and they’ll last a good long time. Note for the lazy forager: If you’re surrounded by black walnut trees (lucky you) but not up to the task of husking and shelling and picking, consider making nocino. It’s a delicious, strong, dark, slightly bitter digestif, that’s as tasty poured over vanilla ice cream as it is sipped slowly from a glass. I have thousands and thousands for free. Come and get em. If I were near you, I would! Where do you live, and how big are these trees? thanks. Ihave 2 trees in my yard and the nuts are a nucience all over the lawn sometimes I mow over them. Maybe you have a neighbor who’d like to cook with them. Where can I get the special tool to crack the iron shells? We have Juglans californica here. Is this also edible and can go under the same processes? I’ve seen them but I haven’t seen any nuts yet. Thank you in advanced! Yes, Luna, you can use Juglans californica the same way I use J. nigra. That’s the black walnut most common in SoCal, while J. hindsii is more common in NoCal. Back east I have only one species to choose from, but fortunately they’re plentiful! I live in Livonia Michigan and our street is known for the number of black walnut trees. We don’t use them. Are you tempted to start? Anyone have recipes for using blk walnut? Take a look at these links, or type “black walnut” into the search bar in the right column of my blog to find all the posts about black walnuts. Hope this gets you started. Cant wait to try some recipes, thanks! The key to cracking black walnuts is to break the “crown” of the nut on each of the pointed sides. The easiest way to do this is with a bench vice and a couple of sockets from a ½” drive or 3/8″ drive socket set. Center the point on each end of the black walnut in the open end of a 5/8′ or 3/4″ inch socket. Hold that 3 piece combination (the two sockets with the walnut in between them) together in your hand while you squeeze it in a bench vise. Just squeeze it enough in the vice so the sockets break the “crown” of the nut on each side. This method will give you the best chance of removing the nut meats in big pieces. With a little practice you’ll become an expert. Helps to have a pair of side cutters handy to snip some stuck pieces free, but this is the best method I’ve found.